The Upanishad has been so named because it forms a part of the Taittirīya Āraṇyaka of the Krishna Yajur Veda, Taittirīya Āraṇyaka itself forms the latter part of the Taittirīya Brāhmaṇa and this Upanishad constitutes the seventh, eighth and ninth parts of the said Āraṇyaka. The First Book - Śīkṣā vallī represents a beautiful address to young novitiates on the spiritual path, telling about the virtues they should try to possess and cultivate, the ideals of life they should foster and other rules of conduct to form a noble character. 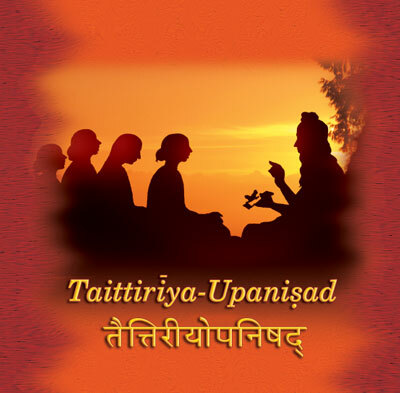 It was the First Chapter of the First Part of Taittirīya Upanishad. Thus has been spoken of the chapter on phonetics. It was the Second Chapter. to us there be the effulgence of the sacred knowledge! and with regard to self. They call these the Great Conjunctions. and the sky is the union. The Air is the medium of that union. So much as regards the World. water is the conjunction, lightning the medium. Thus far with regard to Lights. knowledge the conjunction, teaching the medium. So far as regards Knowledge. progeny the conjunction, procreation the medium. So far with regard to Progeny. speech the conjunction, tongue the medium. Thus far as regards the Self. So these are the Great Conjunctions. with the effulgence of the sacred knowledge, with food, etc. and also with the heavenly worlds. It was the Third Chapter. the Lord enliven me with intelligence. Of the Immortal, Oh God, may I be the possessor. may my tongue be sweet; with ears much may I hear! may Thou protect what I have heard. along with the woolly (sheep) and cattle. Svāhā! May Brahmachārins come to me! Swāhā! May the Brahmachārins come to me quickly! Swāhā! May the Brahmachārins come to me from all sides! Swāhā! May the self-controlled Brahmachārins come to me! Swāhā! May the peaceful Brahmachārins come to me! Swāhā! Among men famous may I become! Swāhā! Superior to the wealthiest may I be! Swāhā! Oh Lord, may I enter into Thee! Swāhā! May Thou, Oh lord, enter into me! Swāhā! By Thee of thousand branches, Oh God, I cleanse myself! Swāhā! may the Brahmachārins come from all sides! Swāhā! mayest Thou absorb me in Thee. It was the Fourth Chapter. are the three sacred utterances. has been taught by the son of Mahāchamasa. That is Brahman. That is the Ātman. All other gods are the other limbs. because by the sun all the worlds are nourished. Swāhā the sun and Mahā the Moon. Verily by the Moon are all the luminaries maintained. because by Brahman are all the Vedas glorified. Swāhā the Vyāna and Mahā is the Food. By Food verily are all Prāṇas fostered. These four are four-fold. Four and four are the Vyāhṛtis. He who knows them, knows Brahman. To him all gods carry offerings. immortal and of golden effulgence. is the path to the (attainment) of Indra. in the Sun as Swāhā, in Brahman as Mahā. He himself becomes the Lord (of all the gods). the lord of the eyes, the lord of the ears and the lord of the intellect. exuberant with the wealth of peace, and is immortal. O Prāchīnayogya, do thou thus meditate upon him. It was the Sixth Chapter. – thus far regarding the creatures. the skin, the flesh, the muscle, the bone and the marrow. All this is Pāṅkta (five-fold). By the Pāṅkta he sustains the Pāṅkta. OM is Brahman. All this is OM. This OM is (uttered) to indicate consent. And also it is well-known that by uttering OM they begin chanting. With OM they sing the Sāma songs. OM Śom say they and recite Śāstras. OM – thus the officiating priest says (his) answer. With OM the Brahmā makes (his) assent. “May I obtain Brahman.” And Brahman he attains. (thinks that) truthfulness alone (is necessary). so holds Taponitya, the son of Puruśiṣta. that verily is penance, aye, that is penance. It was the Ninth Chapter. I am the starter of the Tree. My fame (soars high) like the mountain peak. and am the true Immortal, as is one in the Sun. – thus runs Triśanku’s teaching of the supreme knowledge. It was the Tenth Chapter. “Speak the truth. Perform Dharma. Swerve not from the study of the Scriptures. (thou) shouldst never cut the thread of progeny. Never swerve away from truth. Swerve not from Dharma. and deviate not from prosperity. Let thee not stray away also from the study and teaching of the Vedas. Never swerve from the rites due to the gods and to the manes. and, (so also) let thy guest be unto thee a god. that are free from blemishes and not others. that are good and not others. engaged (in the prescribed duties) (or) unengaged. devoted to Dharma, engaged (or)unengaged. This is the injunction. This is the advice. This is the secret of the Vedas. This is the commandment. This should be observed. And verily this should be observed (by thee).